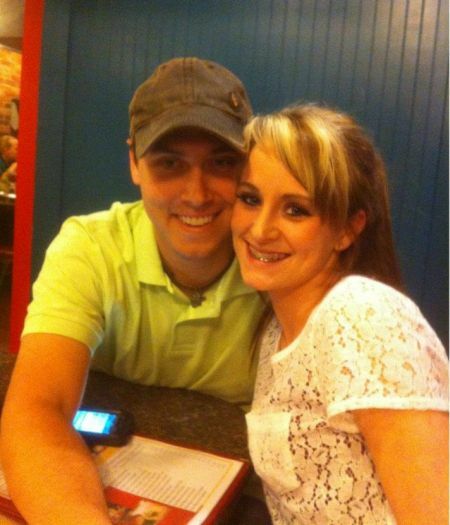 ‘Teen Mom 2’ Star Leah Messer Marries Fiance Jeremy Calvert! According to the Reverend who supposedly performed the service, Teen Mom 2 star Leah Messer married her fiance of four months, Jeremy Calvert, on Tuesday! According to this story in the local newspaper, MTV put in a call to Rev. Marty Gute of the Catlettsburg Wedding Chapel in Catlettsburg, Kentucky, asking if they could film a scene for ‘Teen Mom 2’ there. The Reverend agreed, despite not having any clue who the couple was. “When I asked what was going on, they said it was for the Leah Simms wedding, and that name didn’t ring a bell at first,” the Reverend told the paper. His wife and daughter, who are fans of the show, had to fill him in on who he was marrying! He’s a man of the cloth…I have a hard time believing he would lie about something like this just to get a little fame. Here’s all the details of Leah and Jeremy’s big day! Only about 15 people attended the event, including Leah and Jeremy’s parents, and Leah’s twins, Ali and Aleeah. The wedding was an hour late in starting due to a hold-up with the rings. The couple was filmed before the ceremony as the obtained their marriage license from the Boyd County courthouse. They were also filmed purchasing their wedding rings. Leah and Jeremy plan to have a larger, not-made-for-TV wedding in the near future. Of course, ‘Teen Mom 2’ fans are bound to be skeptical of the story. However, from what The Ashley can gather, this story is totally legit. The Ashley will update this story when she sleuths out more information! Shoutout to All the Teen Moms for finding this gem of a story! My second husband and I got married after only knowing each other as well. I had two children of my own, he had none, and I was unable to have any more. I was only 26. We will be celebrating our 16th wedding anniversary in 2 months. I had been married for 6 years to my first husband and our divorce was finalized for only 27 days when I remarried. So just because she chose to remarry so soon does not mean it can not work out. I wish them the best of luck. She’s a kid with two kids. She seems like she has taken more responsibility for staying home with her kids and loves them as much as any mother loves her children. She’s made some serious mistakes as the world watches. No pressure…lol. I’m sure its scary and lonely for her. I doubt one of us can say we havent made the same mistakes twice. These are big ones but when you’re so young, it’s impossible to realize the permanance of your decisions. I feel for her . And where you have a wedding should NOT matter. It’s a covenant between God and man. People make such a huge deal over the ceremony that’s over in a few minutes, go into debt and hurt their financial future over a dress they wear once. More should be investedinto the marriage, not necessarily the wedding. I pray they make it through life together, not hope to see tabloids helping to tear them down. Doesn’t matter now what you think of her mistakes. THis is her husband now and people should hope the best for them. Stupid white trash hillbilly. This idiot can’t even speak English correctly, and has now been married twice by age 19. What a complete moron. Don’t expect this idiot to get any kind of education, she’s literally too stupid. are you serious if you dont care then dont write, if you have mean stuff to say keep in to yourself. Actually he would be stupid to take her back so I retract my last comment. Ha! I personally hoped she would get back with Corey. Guess not. I officially have no pity for this girl. Yes, we all make dumb choices in our youth. But you would think her divorce from Corey would teach her not to rush into things, and to make sure she really knows who she is dealing with in a marriage. She hasn’t even KNOWN this guy a year and she’s carried his child (my condolences on the miscarriage, though), been engaged, and now married! When will she stop jumping the gun on these things? What else should we expect from these girls? They will make whatever bad choices they need to make in order to keep the big fat MTV checks rolling in. I give it 6 months and/or another baby before they divorce. And that will be her storyline for the last season of Teen Mom 2. Also, that is the ugliest and tackiest wedding ‘chapel’ i think i’ve ever seen, besides in Vegas. I would NEVER dare get married there. Ew. But that’s white trash for ya! Yee-haw!!! You are so childish….who cares,it was not your wedding so don’t worry about it! I think its cool,i live in the next town from there but i’m in ashland,ky alot! Just kinda wondering why they came to Ky to get married not W.V. Julie i believe she’s only 19. Why does this girl feel like she needs to get married? Unless she’s pregnant again? I don’t understand why she’s what? 21? 22? 23 by now? and on her second marriage. She’s going to be one of those women who has been divorced four times by the time she’s 35 and have kids with three of them. Seriously – get a grip Leah! Wow. That’s … Wow. She just seems to be moving fast with a lot of stuff.